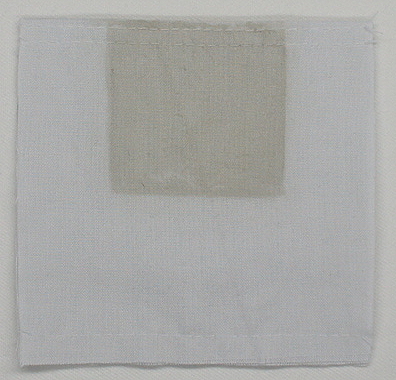 A totally unique set of test fabrics used by detergency labs, specially designed as market relevant monitors to be washed and dried according to laundry practices around the world. Why dingy? What is that? What is the influence of pigments on cleanliness and whiteness? Whiteness Perception. Medium and Long term. 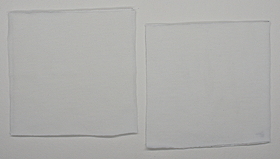 There are six (6) different white fabric swatches per monitor. 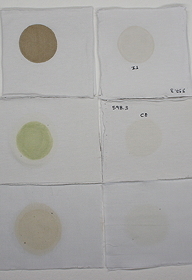 Three of them (first row) represents commercial white garments pre-washed in one cycle with a generic detergent with no dyes and fluorescent agents, and the others three (second row) represents their clean dingy versions after ten (10) cycles of washing/drying cycles, DINGY_CL. Clean dingy fabrics can follow different standard market realities (India, China, Latin America, Europe, USA or others) or customised specific realities according to client needs. This standardised monitor contains one piece of knitted cotton 100%, one piece of woven poly/cotton 65:35, one piece of knitted cotton/lycra 92:8, and their clean dingy versions. Each swatch of 15 cm X 15 cm, total monitor of 30 cm X 45 cm. Ready to experiment with CLLS collection of algorithms, to build a map of consumer perceptual responses at relevant different visual scenarios, based on pairwise comparisons. There are three (3) different fabrics, soiled dingy test fabrics. In just one (1) soiling step, a clean dingy fabric DINGY_CL is soiled uniformly with a combination of fresh body and ambient soils. The final monitor is obtained after a total of eleven (11) washes. All fabric shows a yellowish or greyish or reddish cast pending on the combination of clays used in the process. Soiled dingy fabrics can follow different standard market realities (India, China, Latin America, Europe, USA or others) or customised specific realities according to client needs. This standardised monitor contains one piece of knitted cotton 100%, one piece of woven poly/cotton 65:35, one piece of knitted cotton/lycra 92:8, soiled dingy versions. Each swatch of 15 cm X 15 cm, total monitor of 15 cm X 45 cm. All monitors, with individual stains or combined stains and specific dingy surroundings, are ready to experiment with CLLS collection of algorithms, to predict sensory responses from different types of consumers at relevant different visual scenarios, and to link that responses to actual radiance coming from fabrics at those scenarios, which is the radiant flux that potentially can reach eye’s retina. Consumer cleanliness assessment of laundry product is not the same around the world, but it has been found that some washing problems are nearly the same despite different cultures and habits. Consistently, remotion of easily perceived stains present on white collar and cuffs constitute one of the icons linked to final consumer value delivered by laundry products. Unfortunately this simple cleanliness perception fact from the consumer point of view, is a very complex process from the R&D perspective, not only due to the complexity of the inorganic and organic constituents of the stain, but also due to the interaction of different fabric surroundings (the area in direct contact with the skin and the rest of the collar area) on final consumer cleanliness perception. 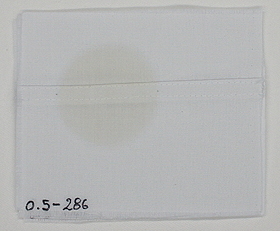 CONSUMERTEC, using a custom-built non-contact mini spectrofluorimeter, has characterised the absolute spectrometric properties of very small fabric areas (less than 6 mm2), like the strip-shaped remanent collar and cuffs stained area after some process of wash, and its fabric surrounding, as well as accurate determination of typical fluorescence spectroscopy properties like: quantum absorptance function, quantum yield, and total, reflected and luminescent radiation coming from the fabric and capable to reach consumer's eyes. 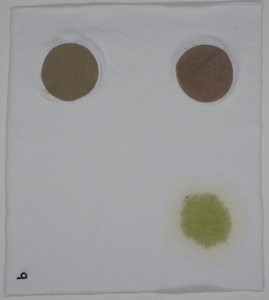 Our approach, a special constructed double-layered test fabric with different dingy surroundings that simulate a worn white collar, with one area of fresh stain that mimic the combination of body and ambient soil, specifically a mixture of components of four groups: sweat gland secretions, sebaceous gland secretions, dead skin cells, and ambient particle and dust. The final monitor is obtained after a total of ten (10) washes and one (1) complex staining step. Surrounding dingy fabrics can follow different standard market realities (India, China, Latin America, Europe, USA or others) or customised specific realities according to client needs. 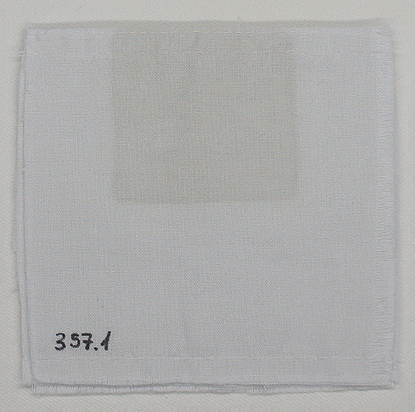 This standardised monitor is prepared on double-layered woven poly/cotton 65:35, clean dingy version. Each monitor of 10 cm X 10 cm. Probably is the second more problematic and common body stain in the consumer market and from the consumer point of view, a truly headache for the person in charge of laundry. From a technical point of view this is really complex stain that results from the interaction of deodorant product ingredients with underarm human secretions and proteinaceous residues, under oxidative conditions at certain temperatures, in a continuous cycles of wearing and washing. Our approach has been to model and simulate consumer realities in order to obtain a standardised stain with relevancy to different market scenarios.The visible stain is generated after three (3) cycles of staining and washing, onto a clean dingy fabric. The final monitor is obtained after a total of thirteen (13) washes. Relevancy depends on different commercial deodorants present in the market, and different surrounding fabric's dingy conditions, which in turn can follow different standard market realities (India, China, Latin America, Europe, USA or others) or customised specific realities according to client needs. 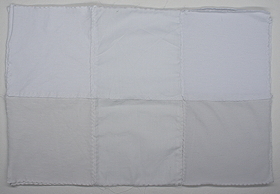 This standardised monitor is prepared on knitted cotton 100% or woven poly/cotton 65:35, clean dingy versions. Each monitor of 11 cm X 12 cm. One (1) monitor contains one (1) fabric swatch with a homogeneously yellowish or gresyish cast. Deposition and redeposition of body soils during continuous cycles of wearing-washing-drying-wearing, accumulate organic fatty-like residues on fabrics, mainly synthetics, capable to be oxidised by temperature and natural UV radiation; this reality generates peculiar malodorous easy to notice as characteristic of long-life used garments. This condition is well noticed in bed-sheets and underwear, usually poly/cotton mixtures, which is nearly not-removed by normal laundry processes. CONSUMERTEC has reproduced these conditions in a standardised way, creating a set of test fabrics to act as a consumer relevant context for olfactive cleanliness perception studies. It is expected that contains a complex odour profile characterised by: aldehydes, organic acids, ketones and esters with fatty smell notes from lipids oxidation, strongly fixed to synthetic fibres. These monitors, have been in use by CONSUMERTEC during the last decade, as a unique and valuable tool to differentiate fragrance technologies present or capable to be present in the laundry market in products like soaps, detergents, softeners, boosters and alike. Current trend in the garment industry is the combination of colours and whites strips. One colour cloth is now the exception. This textile trend is a real challenge from the colour-care perspective, because now the problem is not only to preserve colours but also to preserve the whites areas, because if both are part of the visual scenario, there is full interaction between them. Detrimental changes in the whites areas will affect significantly the colour-care perception due to local contrast effects, colour will be perceived dull. This new dingy monitor from CONSUMERTEC offers for the first time a practical standardised alternative to technology innovators to experiment in the field of colour care in consumer relevant terms. Contrast effects or chromatic induction are very well know phenomenology in vision science but not implemented in the detergency industry, due to the regular use of basic colorimetric procedures. Algorithms to compute this visual effect needs a more complex approach. CLLS collection of algorithms coded by CONSUMERTEC offers this capability grounded on very recent advances in numerical models to represent more realistic interaction between white and colour in the same surface visual scenario. The monitor contains four (4) coloured swatches which are new original fabrics, commercial or standardised (AISE standards). Additionally it contains one (1) white swatch which is a new original fabric and another one (1) which is a clean dingy swatch, DINGY_CL, prepared according to relevant consumer realities, i.e. 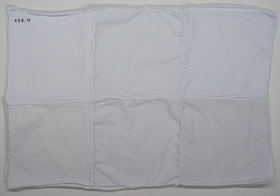 it represents a clean dingy white garment after ten (10) cycles of washing/drying cycles following different standard market realities (India, China, Latin America, Europe, USA or others) or customised specific realities according to client needs. This standardised monitor is prepared on cotton 100%. Each monitor of 22 cm X 40 cm. Ready to order? or need assistance? In order to ensure quality, test fabrics are subject to an instrumental evaluation control when each batch of fabric is completed; it is done according to the amount of fabric, which is recorded on a control chart. Coefficient of variance of less than 5% is guaranteed. The fabric should be stored in a dark place and at low temperatures (approximately 5°C). It is also recommended that the package be opened only when tests are to be conducted. Under these conditions, the fabrics will have a six-month life expectancy. Payments are due in 30 days invoice date. Invoice is delivered as a service of material preparation, in .pdf format, once the order is received. DHL is our preferred international courier. Others under request. The "clean" fabric worn by consumers is not clean, it is a dingy fabric. 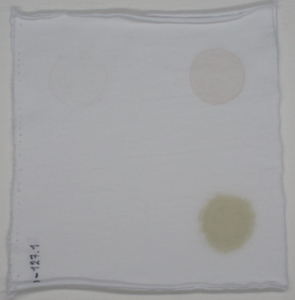 After the first cycles of wearing/washing/drying/wearing, some level of body and ambient soil redeposition occurs as well as white fabrics become yellowish due to a light induced loss of fluorescence, and finally become tinted by deposition of dyes coming from others garments and more importantly by deposition of dyes present in laundry product to improve visual perception. Therefore white clean garments in the market are really clean dingy garments, not-new-garments ready to wear, not ready to wash.
CONSUMERTEC has designed a group of test fabrics to represent this complex reality relevant to the worldwide laundry market. Laundry markets that we represent are: India (two versions), China (two versions), South east Asia, Australia/New Zealand, Japan, Western Europe, Russia, Balkans, Middle East/North Africa, Latin America, USA/Canada, Africa Sub-Saharan. Each laundry market has been characterised by: environmental particle matter, land clays and dust, natural sun radiation during drying/wearing, washing conditions and laundry products. The general code of these group of clean dingy monitors are Dingy_CL. Consumer understanding means experimentation. The challenge for innovation teams is to understand how different consumer segments around the world perceive benefits during the complex interaction with brand and products under a myriad of scenarios. The only reliable way is to characterise market realities piece by piece, one in a time. In-vitro models are one of those pieces. Using in-vitro dingy test fabrics models, for whiteness, cleanliness, olfactive-cleanliness or colour-care understanding, marketing teams will be more confident in using fabric monitors which appear similar to the real ones. R&D teams use in-vitro models to include market realities in the lab, and have the opportunity to conduct experiments to understand the influence of several variables, including different technologies and formulas, on final performance from the point of view of the market. CONSUMERTEC dingy fabrics are part of the experimental work at detergency labs as well as part of marketing activities to collect consumer responses from visual sensory analysis at home level under real visual scenarios. Why CONSUMERTEC test monitors are spectroscopically characterised for fluorescence measurements? Most of CONSUMERTEC monitors are produced from commercial white fabrics, which means fabrics with high levels of fluorescent agents and pigments applied in the textile mills. That simply fact changes everything in fabric subsequent reflected and emitted radiant energy capable to reach consumer eyes. Extraneous material on them generate complex collisional fluorescence quenching process, that changes significantly fluorescence emission profiles and quantum absorption functions. 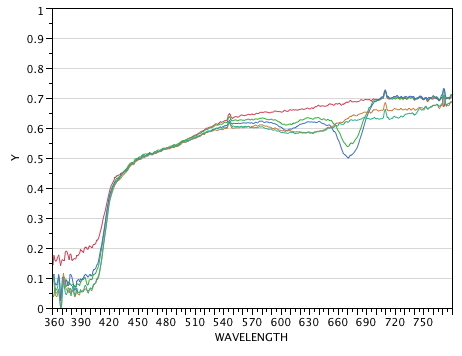 For that reason, in order to predict further changes on fabric reflectance and emission under illuminant with different UV relative content, it is mandatory to precisely characterise the fluorescence properties of dingy fabrics, which become fabric fingerprints, and the starting point to generate predictive spectral properties. Why is so influential the presence of pigments on wetted or dry washed fabrics? For many years the laundry industry introduced coloured pigments on bar, powder and liquid detergents only due to aesthetics reasons, and the favourable consumer acceptance was interpreted as a matter of product hedonics. However in the last decade, new understandings about visual perception, specifically the importance of lightness and colour contrast, have helped to move our attention on the positive influence that pigments would have on cleanliness and whiteness perception. Now this field is part of the brand and product design efforts. 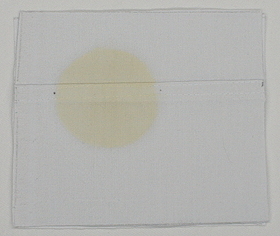 Low levels of shading dyes with a greenish, bluish or reddish cast, combined with the greyish and yellowish shade due to soils redeposition and loss of fluorescence (after several cycles of washing and drying), configure the specific fabric surrounding area for the remanent stained area after some washing process. Final consumer cleanliness-enough perception will rest on final comparison of those two areas; by this way pigments design affect cleanliness perception, and that will be more or less critical depending on fabric-pigment affinity. Whites are not the perfect white (100% reflectance of incident radiation on the visible spectrum). 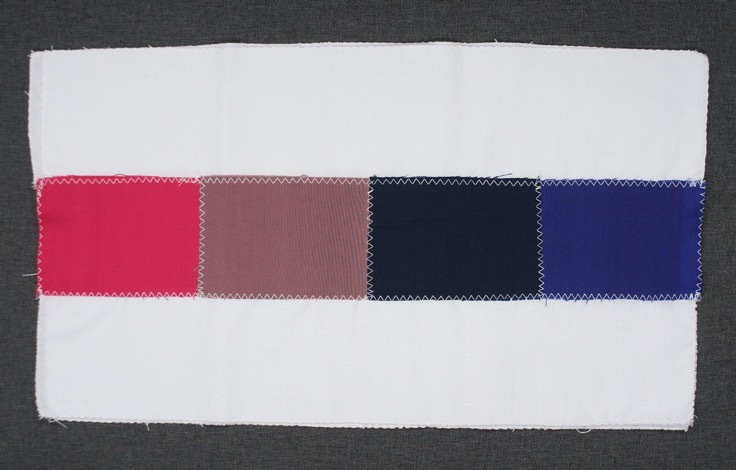 Commercial white fabrics on the garment markets contain high levels of fluorescent agents and are well pigmented, mainly with a bluish, greenish or reddish cast. On the consumer side, the acceptable and preferred level of whiteness is strong affected by previous perception during years as well as local conditions like white fabrics on the market and also by leading pigmented washing products. Finally, what consumer segments consider as enough and acceptable level of whiteness on critical garments after 10, 30 or more than 50 washes (as happens with white school uniforms), has to be locally characterised and understood, and well planned as part of the consumer value proposal which is designed by innovation teams. Last but not least, it is now well understood that during soaking stages, the visual perception of wetted pigmented white fabrics, i.e. the level of change detected in comparison with the dirty condition, has a definite influence on the final consumer cleanliness and whiteness benefit perception, which is a good example of a priming effect; in other words the product has to show that performs fine from the beginning! Therefore, visual perceptions of pigmented wetted fabrics at the soaking stage (when exists) has also be designed.